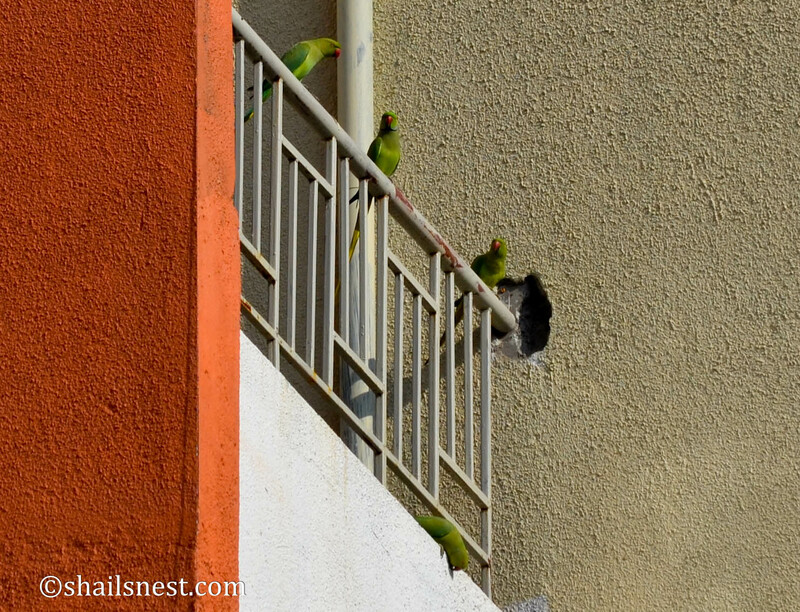 During my last visit to Pune, while standing at the balcony of the Second Born’s apartment with my morning tea, I heard the all-familiar squawks. 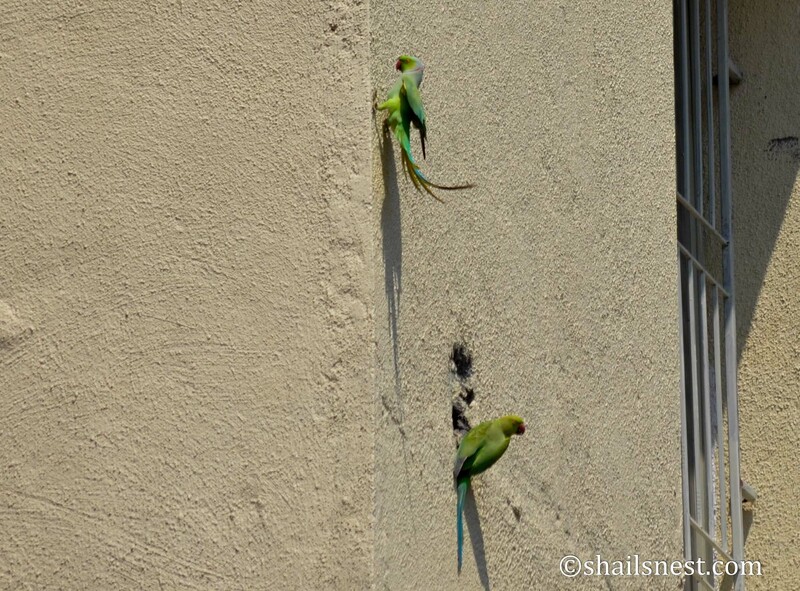 Parakeets! I craned my neck this way and that trying to spot them. No luck. Then I noticed a movement way up on the railings of a balcony some floors above mine in the next block of flats. I quickly went in, got my camera and zoomed in. 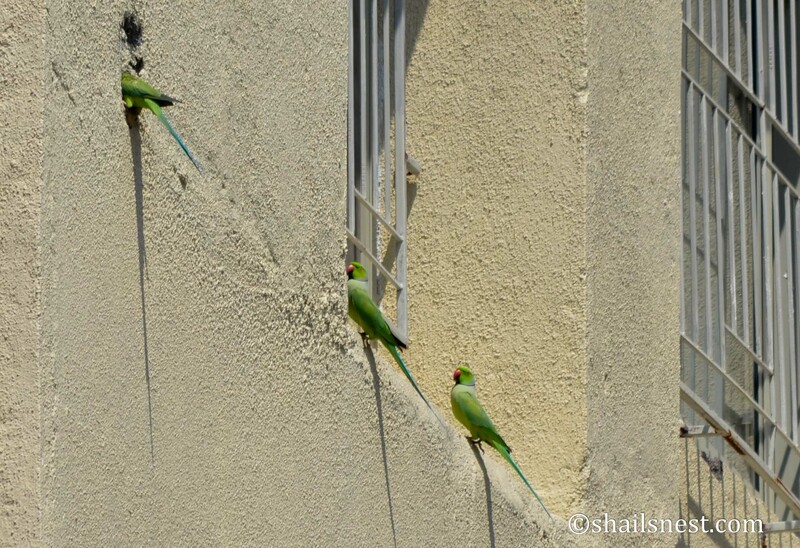 There they were: Rose-ringed Parakeets in their characteristic green, red beak, a hint of blue in their tail feathers and a look of disapproval/disdain (at least, that is how it looks to me) for the rest of the world plastered on their faces. After clicking a few pictures I realized something was ‘happening’ out there. 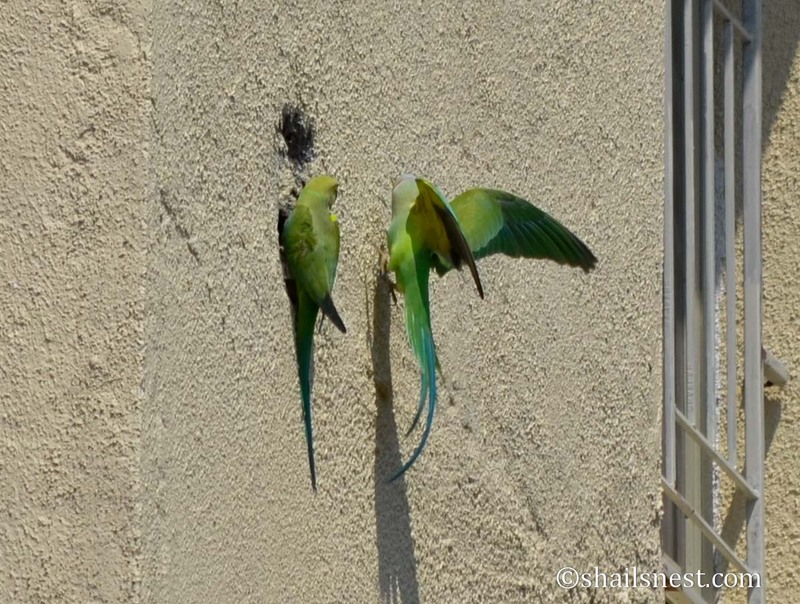 There was one parakeet with head and half its body inside a hole in the wall while another kept watch, chasing others away from disturbing it. There was another smaller bird (not in the pictures) trying to buy into the action as well, but promptly chased away by the parakeets as one. 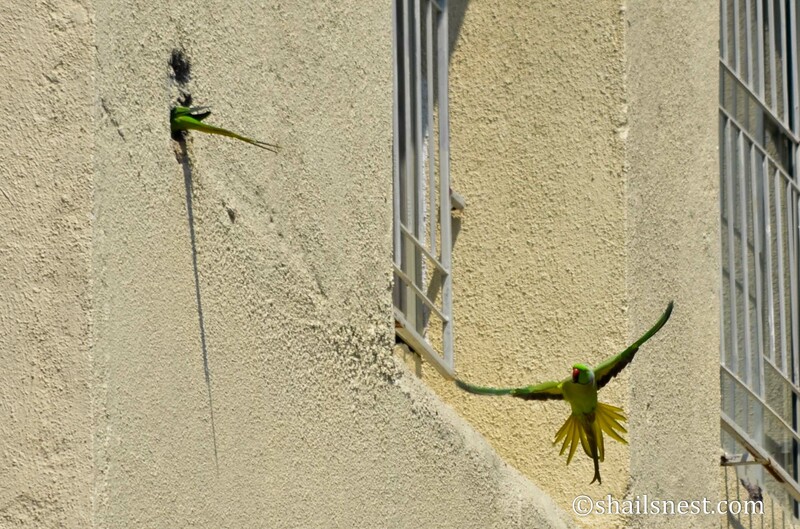 It was not apparent whether the rest of the gang were there to give moral support to the pair defending the hole-in-the-wall or were competitors themselves. They put up quite a show, though, which being really far up and at a difficult angle for me to capture, ended up giving me a crick in the neck. 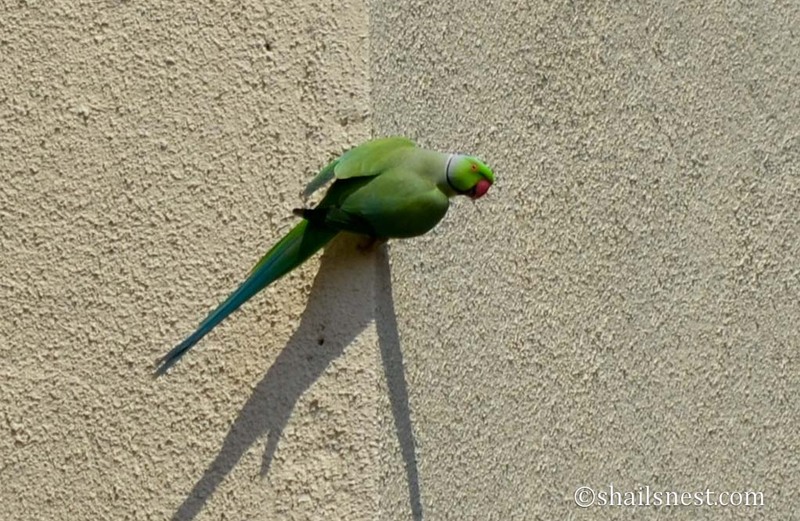 This here is a parakeet in a Spiderman pose, while keeping an eye out for its partner. 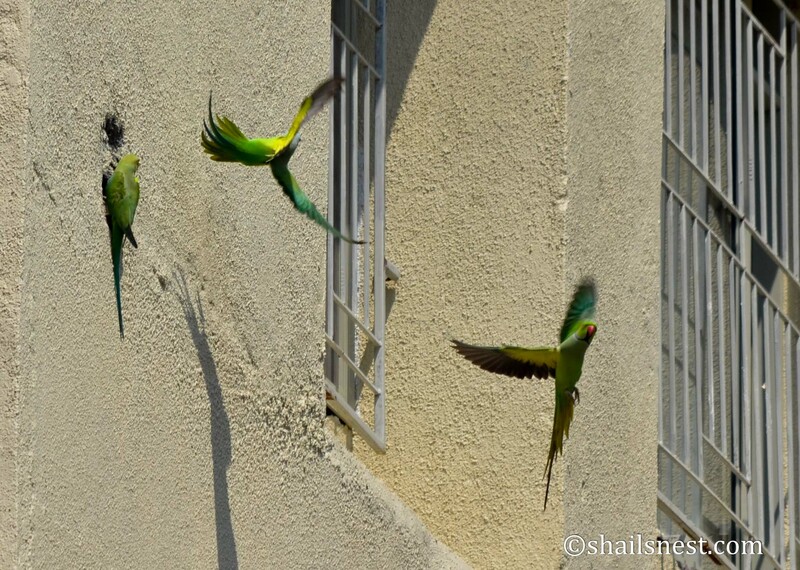 Imagine the son’s surprise when I told him about the parakeets. I have been here for months now and neither I nor my friends have ever seen any, he exclaimed. Obviously, if you sit glued to your computer (and also work so hard that you return home late and wake up late too), you are gonna miss the avian life around, aren’t you? You can see more of my bird pictures, at Only birds. What a view into the parakeets’ lives. I can hear their sounds so clearly. 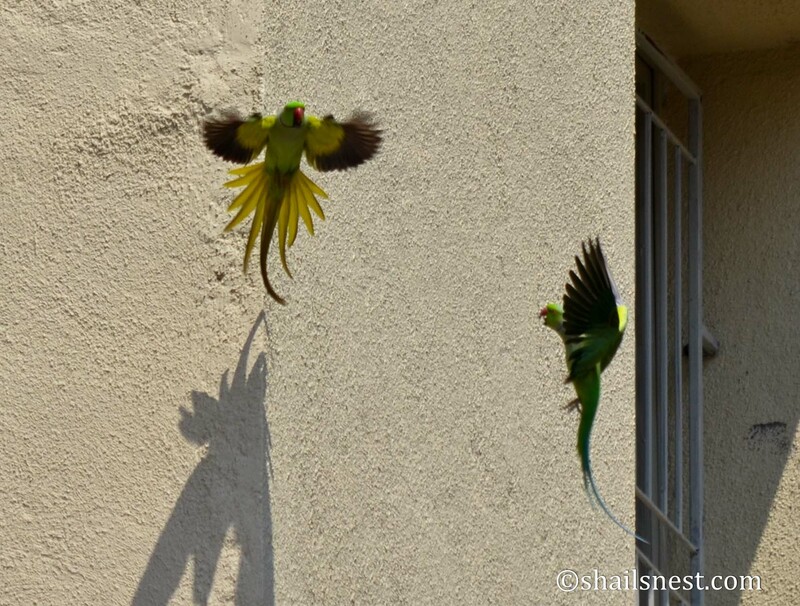 I love the parakeet with the shadow parakeet image. Shail you are super amazing! You are all the more amazing dear! Dying to meet you in person! And yes, I also know what to get you when I come visiting you your favourite CHIKKI right? All these shots are fantastic! If there was bird life this rich in my neighborhood it would be impossible to drag me indoors. We do have a large number of crows and a few ravens that roost in the nearby tree, so my 15 month old granddaughter and I spend quite a lot of time enjoying their antics. She loves the crows so much that whenever she hears them caw she runs to the patio door and caws back at them. I clicked a couple of crows recently and remembered you, Sally 🙂 How sweet that your granddaughter is enjoying birds! She’s so fond of crows that we made her a crow costume for Halloween. Quite a story and pictures are great too. You must have craved for a helicopter to get a better view. clap clap clap for taking the birds along everywhere you go. You are just truly amazing. And what lovely clicks…esp the spiderman shot and the one with the wings wide open ! !